Forza and BMW’s have made a nice fitting partnership for Forza Motorosport 4, and will feature the new 2012 BMW M5 as well as the BMW design challenge. In celebration of this new partnership, The “BMW M5 Fan Pack” will come with every new copy of the game Forza 4. In addition the Collector’s Edition comes with 25 bonus cars. Forza Motorsport 4 standard and Collector’s Edition will be released on October 11. Forza 4 will even use Kinect for things like turning you head with the cockpit camera and will only run you $79.99, which is an offer you almost cannot refuse once you read everything you get. The BMW Design Challenge is a contest will let you customize a 2010 BMW M6 Coupe by painting your very own designs on the a computer. In order to make sure you are a qualified artist you must read the contest details and rules thoroughly. You will first need to download this digital PSD template of the car and then once done designing your car digitally on your PC, you must save the file in hi-res at around 300 DPI, not flattened with layers in original PSD format in the case that you become one of the finalist. Before you can do that though you will need to submit a JPEG version of your design to ForzaContests@microsoft.com by Sunday, July 31, 2011, as any emails received after that date will not be eligible. Your submission must not exceed 10MB and all entries must include the subject line “Forza Motorsport 4 BMW Design Community Challenge”. All entrants will be judged by originality, technical execution, and creativity. The winner of the Forza Motorsport 4 BMW Design Challenge program will have their design featured in Forza 4, as part of the Limited Collector’s Edition of Forza Motorsport 4! 2010 BMW M6 Coupe featuring the winning design from the “Forza Motorsport 4” BMW Design Challenge. 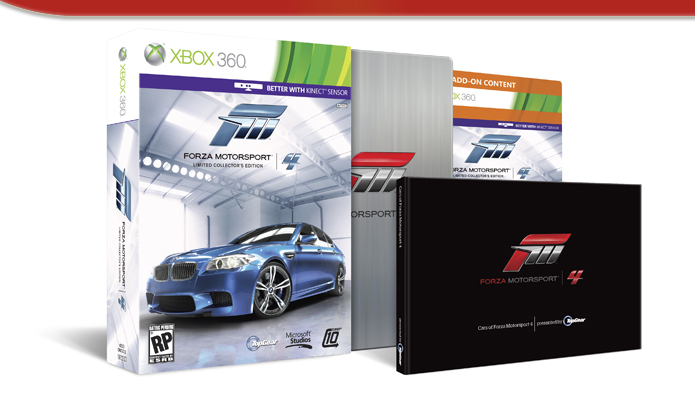 The limited quantity “Launch Bonus” car pack available for the first fans to pick up their copy of Forza Motorsport 4 or the Forza Motorsport Limited Collector’s Edition (while supplies last). “Cars of Forza Motorsport 4 Presented by Top Gear,” written by the “Top Gear” team, is a stunning 96-page book that describes in-game cars from the Autovista experience and features imagery from game and the Top Gear photo library. A vinyl sticker set featuring the logos of “Forza Motorsport 4,” “Top Gear” and Turn 10. You will also get an Xbox 360 BMW Premium Theme as well.